On 25th of May 2019 SkyUp Airlines start direct flights Barcelona - Zaporizhia with low cost return tickets of 197 Euro connecting Spain and Ukraine in their summer schedule. Flights Barcalona - Zaporizhia will be held two times a week - each Wednesday and Saturday. The schedule provides information about departure of Barcelona, Spain at 10:00 and arrival in Zaporizhia, Ukraine at 15:10. On back way departure of Zaporizhia at 16:10 and arrival in Barcelona at 19:00. Time of one way flight Barcalona - Zaporizhia is 3 hours and 50 minutes. Airports of flights are Josep Tarradellas Barcelona-El Prat Airport (BCN) and Zaporizhia International Airport (OZH). Flights Barcelona - Zaporizhia will be performed in Basic, Standard and Flex class of service. The aircraft that will be used on the route Barcelona - Zaporizhia is Boeing 737-800 NG with 189 seats. 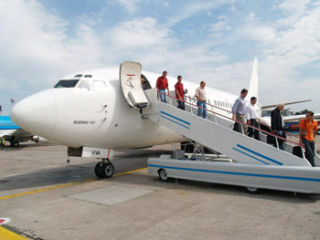 Return ticket cost of flights Barcelona - Zaporizhia is around 197 Euro in Basic case of service.